Spring Beauty is a member of the Portulaca Family. The plant grows to 4 inches in height and has smooth, dark green, lance shaped leaves that grow in a single pair on opposite sides of the stem to 1.75 inches in length. The plant typically grows in moist coniferous forests at elevations between 5500 - 8000 feet. The Spring Beauty at right was photographed in the pine forests around Sedona. 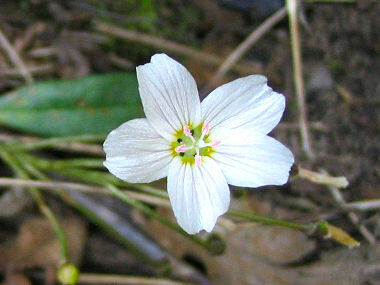 Spring Beauty blooms between February - May and produces a white to pinkish flower with 5 petals to 5/8 inches in width. The stamens of the flower are tipped with pink.